latest 21 Vacancies for various Post of Project Scientists on contract basis to work at NRSC/NIRDPR for the project ‘Geo-MGNREGA (Applications Development & Infrastructure) Implementation initially for the period of one year (depending upon satisfactory performance, likely to be extendable for further period of one year or co-terminus with the project period whichever is less). Qualified applicants who are fit for these positions they must apply online on or before last date given on the same place. Only digitally filled online application Form is invited from experienced individuals to cash this chance of careers. Capable appliers need to clear selection rounds that are written exams / online test/ interview. 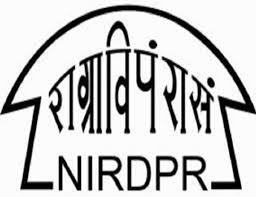 All aspirants suitable for these posts need to visit the official website of NIRDPR Hyderabad to apply online for Project Scientist 21 Openings. Dear aspirants also keep safe one copy of deposited form for future use. Important guidelines in favour of steps to submit form for NIRDPR Hyderabad Recruitment are declared below. All the best to every applicant of this golden chance of job! Further great jobs options in Telangana will be available by visiting the official website of this organization of public sector that is www.nird.org.in. Further new public sector jobs will also be here if connected with this portal. Best of luck to all the visitors of this article!! Educational Records: Appliers must have related Graduate / Master Degree/ Diploma from any University in India established or incorporated by or under a Central Act, Provincial Act or a State Act or an Institution recognized by the UGC. Age Limitations: Candidates age must not be over 35 years. Age relaxation may be given as per rules of department. Selection Process: Applicants will be appointed as per their performance in written examination, Trade Test and interview. Original certificates of qualification / experience for verification along with attested copies have to present on demand at the time of interview. Salary: Selected candidates will get pay scale of Rs. s50000/- per month. Enter on “Notification” tab from the middle side of the homepage. After successfully submission of form take a print out for further use in the process of recruitment.